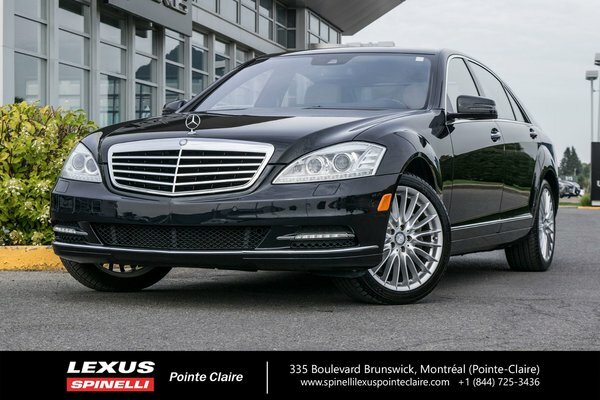 Home > Used Vehicles > 2010 Mercedes-Benz S-Class S 550, SEULEMENT 87 600 KMS!, UN PROPRIÉTAIRE ! LOW MILEAGE, CLEAN CARPROOF, VERY RARE! 2010 MERCEDES-BENZ S550 4MATIC. Only one owner. Low mileage of only 87606 kms. Clean Carproof report. Taken in on trade for a new Lexus LS460. 5.5L V8 with 382 h.p. and 7 speed automatic transmission. leather upholstery, dual-zone climate control, walnut trim, navigation system with voice recognition, heated 14-way power front seats with lumbar, heated power mirrors, 600-watt harman/kardon 15-speaker, 6CD, Logic 7 surround sound system, front/rear illuminated vanity mirrors, air suspension with ride height and damping control, bi-Xenon headlamps, and full power accessories, moonroof, 18-inch wheels, and much more. Engine : 8 Cylinder Engine 5.5L - 8 cyl.